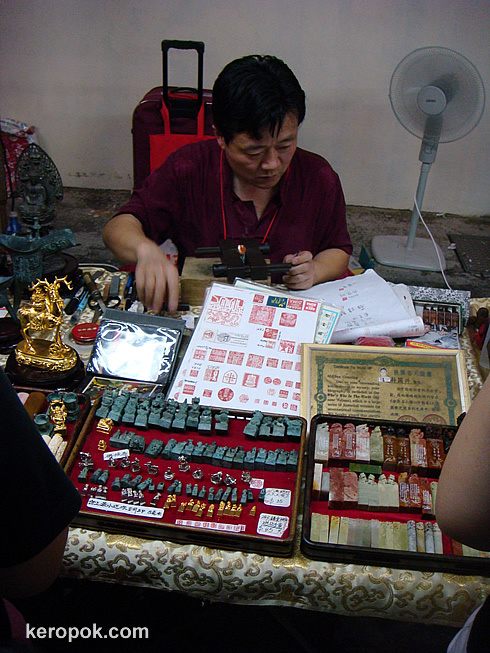 A man making the traditional name seals. It's your name in the Chinese Characters engraved on stone. This guy is making them at the Chinatown Night Bazaar. i have one! i had it made whn i was in beijing perhaps 12 yrs ago. that was before those things came to S.E.A. haha. I had mine made in Sydney from a mainlander. Pretty interesting stuff. Did you know that these seals can be used as official signatures in China?